Domonic Brown certainly was impressive during his stay in the big league camp. He just needs to play and play and play and someday he will be here. Both Jamie Moyer and Kyle Kendrick certainly pitched well enough to grab the fifth spot. So, we have six starters. Depth is always welcomed. The season is a marathon. Over in the minor league camp, kept hearing impressive things about a young right-handed pitcher, Jarred Cosart. Remember that name. This honor goes to Mother Nature. Winds from the north/northwest dominated the spring. The winter was the coldest in St. Petersburg in 96 years. Really great to be part of history! One day in mid-March, the temperature at 4:30 p.m. in Clearwater was 62 degrees. Back in Philly, it was 68. Figure that one out. Frank Coppenbarger is the Phillies travel person, equipment person, ticket person, hotel person, and whatever person. He’s also a veteran who has been around and around and has seen about everything. Said he had a first one day: he couldn’t rent a car for a player because that player was too young. Later, an older player asked to borrow his reading glasses. Games at Bright House Field are like a festival. Sellouts were the norm. Fan support was unbelievable. Performed an unscientific and unofficial poll one game of the most popular Phillies jersey fans were wearing. Number 1: None other than #26, Chase Utley. Also saw one #27 with the name Montanez on the back. Needless to say that person was in the senior citizens category. Or, he was old, like Willie. J. D.’s is a restaurant in Indian Rocks Beach. Hand made signs are displayed everywhere. Home plate umpire Phil Cuzzi walked to the screen behind home plate at Bright House Field one afternoon and handed a baseball to a little boy, who appeared to be about 5 years old. The boy rewarded Cuzzi with a lollypop. Fans applauded the trade. We had Phillies Alumni throw out the first ball for nearly every Clearwater game. The most popular was an Alumni battery of John Kruk tossing to Darren Daulton. Bill Houser and his wife, Wilma, are yearly spring training visitors. He’s a security supervisor at Citizens Bank Park. Last Sunday when the game was rained out, Wilma headed for the Clearwater Threshers office while gentleman Bill said he would get the car from the parking lot and meet her in front of Bright House Field. Very touching gesture. He boarded a trolley bus he thought would be take him to the parking lot. Wrong. The trolley was on its normal route of stopping in Clearwater along the way to Island Estates and then to Clearwater Beach. Bill got to see the sights on a rainy afternoon. When the last passenger exited on the beach, there sat Bill and the driver. (Wilma is still sitting in the ballpark). Lucky for Bill, the driver was a retired SEPTA bus driver from Philadelphia who was kind enough to drive him back to the ballpark. An hour and a-half later, Bill and Wilma were reunited, making for a happy ending. Very touching scene. If you see Bill at Citizens Bank Park, don’t ask him for directions to the parking lot. He might put you on a bus to Atlantic City. Final Florida days are here. A week from today, the season starts in DC. Prior to this afternoon’s game, three annual awards were presented on the field. The Bill Giles and Larry Rojas awards were first presented in 1999 to two players in the Phillies minor league spring training camp, one being Hispanic. The winners are chosen on the following criteria: love and respect for the game of baseball, an outstanding work ethic and pride in being a member of the Phillies. These attributes describe Giles and the late Rojas. Pitcher Jarret Cosart received the Giles Award and catcher Sebastian Valle, the Rojas Award. Started in 2007, the John Vukvoich Award is presented annually to an instructor in the Phillies organization that embodies the characteristics of the award’s namesake: loyalty, dedication, competitiveness, knowledge, honesty and a terrific work ethic. This year’s honoree is the field coordinator of the Phillies minor league system, Mike Compton. Minor league camp released the following 12 players this morning: LHP Spencer Arroyo, RHP Freddy Ballestas, RHP Ryan Bergh, RHP Joe Bisenius, LHP Sean Grieve, RHP Rick Guttormson, RHP Jordan Meaker, RHP Todd Van Steensel, 1B Jeremy Hamilton, OF Gus Milner, OF Arlon Quiroz and OF Brad Wilkerson. Time to close down the Bright House Field office. Will be heading home on Wednesday. Will have one more post tomorrow, the annual spring training review. Then, Phillies Insider will be on the inactive list until April 5. Thanks for reading. Also, thanks for voting for Phillies Insider in the NCAA tournament-style blog competition. Phillies Insider reached the 18-blog bracket before being eliminated by Crashburn Alley on Saturday. Now, I know how Kentucky basketballers feel. Camp down to 31 as John Mayberry, Dane Sardinha and Ozzie Chavez were sent to Carpenter Complex this morning. Six more players need to go to make the 25-man limit for opening day. Including the two-game On-Deck Series Games next Friday night and Saturday afternoon, there are seven games left before the season opens. Tomorrow is a packing day. Equipment truck leaves Tuesday morning. Team has a charter flight to Philly after Thursday’s game. Spring training is nearly over. “Hard to believe, Harry” as the late Richie Ashburn used to say. Thanks to you the fans, we now have a final five in the Phillies Wall of Fame balloting process for 2010. Over 23,000 fans, the most ever, voted online. Appreciate all the support. Five finalist, in alphabetical order: Darren Daulton, Jim Konstanty, John Kruk, Jimmy Wilson and Rich Wise. A special Wall of Fame Selection Committee, consisting of members of the media, Phillies executives and Phillies historians, will select the winner that will be inducted on August 6. Yearly pre-season promotion begins tomorrow noon at the Please Touch Museum in Philadelphia. 20,000 pounds of the Phanatic will be on display. No, it isn’t one King Kong-sized Phanatic but 20, 6-foot, 100-pound fiberglass Phanatic’s that will be on display at the Museum until 2 in the afternoon. Scott Franzke and the Ballgirls will also be there. Event, co-sponsored by the Greater Philadelphia Tourism Marketing Corporation, is open to the public at no charge. In other words, free. In the true spirit of the week-long events, Phillie Phanatic will be red. Sorry, but the mascot looks better in green. A daily feature–spring training memories by Phillies Alumni, who were asked three questions: (1) Memories of their very first spring training; (2) What they liked the most about spring training, and (3) What did they like the least. “Favorite thing about spring training had to be the weather. Coming down from Chicago in mid-February was awesome. Clearwater was a great location. I experienced a couple of other areas in spring training after leaving the Phillies and nothing was better than Clearwater. Least favorite part? Nothing. There is nothing better than playing baseball whether it was spring training or the season. 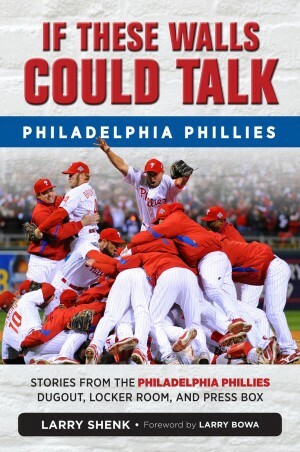 Todd Zoelcki sent an e-mail this morning, Phillies Insider is in the running for the Final Eight of an NCAA tournament-type bracket of the top Phillies 65 blogs. Phillies Insider has a “game” today agasinst Crashburn Alley. A week from today, the Phillies will board a Delta charter flight after their game and head back north. Pirates will be at Citizens Bank Park for On Deck Series games April 2-3. Current camp number is 34 players, nine above the opening day limit. Ruben had his weekly conference call this morning with his pro scouts that are scattered around Florida and Arizona. Always looking for ways to improve the club. Notes: Minor leaguers here for the Astros game this afternoon are four right-handed pitchers, Jason Anderson, Justin DeFratus, Chris Kissock and Eryk McConnell . . . Internet broadcast today, WPHT tomorrow and Saturday; Comcast SportsNet and WPHT on Sunday . . . Bus leaves Bright House at 3:15 p.m. tomorrow for the 7:05 night game in Tampa against the Yankees . . . Saturday, the Twins in Ft. Myers; buses leave at 7:45 a.m. . . . Minor league games at Carpenter Complex on Saturday begin at 10 a.m. Minor league teams break camp on April 4. (Note: Keith will have his U. of Texas baseball uniform number (3) retired on May 1). All aboard. Two buses departed Bright House Field at 8 this morning for Lake Buena Vista and a 1 o’clock game with the Braves. It will be televised nationally on ESPN. All the regulars are on the trip, except Werth. He and Gload will get in some at-bats in minor league games this afternoon. Lidge is also pitching at Carpenter Complex. Minor leaguers on the trip include pitchers Tyson Brummett, Alex Concepcion, Chad Poe, Michael Schwimmer; infielders Troy Hanzawa, Fidel Hernandez and outfielder Brad Wilkerson. Phillies photographer Miles Kennedy has been busy the last week photographing players, wives and families for a Phillies Cook Book that the wives will be selling during the season. Goal is to have the publication available by Mother’s Day. Imagine Jimmy Rollins in a chef’s hat, apron and spatula in his right hand? Back home with the Astros (broadcast on Phillies internet) . . . Halladay will be pitching in a minor league game at the Complex . . . WIP Radio with Howard Eskin and Ike Reese will broadcast live from the Tiki Bar from 3 p.m. to 7 p.m. Faithful reader Stu responded to yesterday’s plea for contact information for Lou Lucier, a former Phillies pitcher who turned 92 yesterday. Now, we can send a Phillies jersey to Lou as a birthday present, although a bit belated. Happy Birthday Lou….Where are you? Rays of sunshine are pouring down on Bright House Field for an afternoon game against the Rays. (Geez, that is really corny). Another sellout in the books. Yesterday’s crowd was 10,724, a new Bright House Field record. With the minor league camp only 200 yards away, there’s a lot of interaction between the two camps. Big league players can get in some innings or at-bats at Carpenter Complex. Minor leaguers are sent over for big league games. Michael Stutes yesterday pitched the ninth inning and picked up the win. Polanco spent some 30 minutes talking with the Hispanic minor league players the other day. Halladay will be speaking with the pitchers. This morning, Davey Lopes had a bunch of minor league players on the half field at Bright House Field going over base-stealing. Very little time is wasted in either camp. Lou Lucier is a 5-foor-8 right-handed former Phillies pitcher who is celebrating his 92nd birthday today. He pitched for the Phillies in 1944-45 and wore #36. 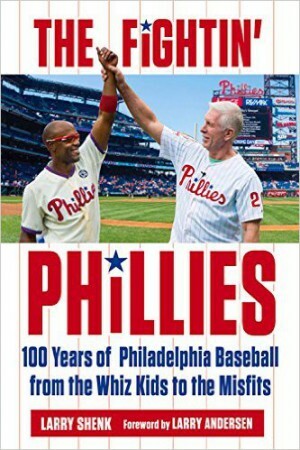 He is one of 10 Phillies Alumni who are the Nonagenarian Club (90 years of age or older). We are sending a birthday gift to our 90 year olds. Unfortunately, we don’t have an address for Lou. So, if anyone out there knows his whereabouts, kindly let me know. Another sellout with the Yankees in Clearwater today. Tomorrow, the Rays are here and yet another sellout is expected. Phillies fans are also in great numbers on road games. Can’t miss the red colors or pinstripe jerseys. Alumni battery today was John Kruk throwing to Darren Daulton. Both remain crowd favorites. Kruk is here for the ESPN telecast. He’s in the ESPN booth again when we play the Braves on Wednesday in Orlando. Notes: Ryan Madson and Brad Lidge threw in minor league games at Carpenter Complex this afternoon . . . Going into today’s game, starters have a 1.96 ERA; overall 3.30 team ERA is lowest of all MLB teams this month . . . Mike Missanelli of 97.5 The Fanatic Philly radio station is live from the Tiki Bar, 2 p.m. to 6 p.m. today and tomorrow. Did You Vote? : 5 p.m. tomorrow is the deadline for fan online voting for the Phillies Wall of Fame. Driving to Bright House Field at 7:30 this morning was strange. Heading east on Ulmerton, the big, orange sun was starting to rise. As bright a sunrise as I’ve seen this spring. In the rear mirror, dark clouds hovered over the Gulf of Mexico. Overhead, were some thin clouds that produced rain drops. Sort of a triple play. By the time I got to Bright House Field at 8, the sun was overtaken by clouds. As the 1:05 p.m. game time approached, there were showers, no rain, thunderstorm, no rain and then rain again. In Florida, if you’re not happy with the weather, just wait a little. Things change. Things did change. At 2:17 a cheer went up from the fans in the park when the ground crew took the tarp off the field. First pitch was scheduled for 3 p.m.
Sunshine is supposed to return tomorrow. Yankees come to Clearwater for an ESPN national telecast at 1 p.m. John Kruk will be in the booth. While the team was in Lakeland, Werth, Polanco, Schneider and Ibanez took batting practice at Bright House Field. Dave Huppert was the pitcher. Nobody shagged so the outfield was filled with baseballs. Kind of resembled an easy-to-find Easter egg hunt. Once BP was over, the players spread out and did their Easter egg hunt, picking up the baseballs. Throughout spring training, Phillies Alumni are providing their spring training memories. Three questions were posed: (1) Memories of their very first spring training; (2) What they liked the most about spring training, and (3) What did they like the least. Greg Castserioto obtained some of the same memories from the current players. It is among the features in the Spring Training program on sale at Bright House Field. Night game tonight, day game tomorrow. Sort of like the regular season. Players’ lives are geared to playing night games, sometimes five straight. Day games break their daily routine. Spring training is different. Only three night games are on the Phillies schedule. One was against Florida State University. Other than tonight? Next Friday, the Yankees in Tampa. Players were told to be dressed by 3 this afternoon for a meeting with the players’ association. BP is doubtful. Tonight: Lakewood Blue Claws will receive their South Atlantic League championship rings pre-game . . . First ball battery will be Galen Cisco, former Phillies pitching coach, and Michael Cisco, his grandson who is in his third pro season as a Phillies minor league pitcher . . . Navy Leap Frogs are scheduled to parachute into Bright House Field. Tomorrow: Phillies play a 1 o’clock afternoon game in Lakeland. Buses leave at 8:45 a.m.. . . Next four Phillies games, starting tomorrow, are on TV; check the spring training schedule on this site for more information . . . While the Phillies are out of town tomorrow, there are two minor league games at 1 p.m. at Carpenter Complex. Elsewhere: Phillies ballgirls have a new blog posted: Down The Lines With the Phillies Ballgirls. Must reading.